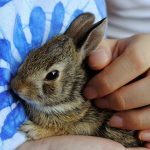 The exterior body parts of your pet rabbit need special care. 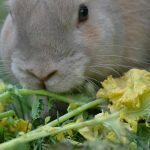 Here is an easy-to-follow guide on what to do on a regular basis for a clean and happy pet rabbit. When and how to do the grooming, what to use or not to use, how to take care of the nails, ears, teeth and feet. 5 We recommend this grooming glove from Bemix Pets. You can find it on Amazon here: Grooming Glove 3-Pack – See our today’s offer! 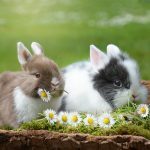 The rabbit breeds with a big and fluffy fur, like the Lionhead Rabbit or Angora Rabbit, need grooming 3 times per week. If for any reason you fail to do that, in that case, your rabbit needs daily grooming. In general, for rabbits like Florida White, you should do the normal weekly grooming. For rabbits with velvet-like fur texture, you don’t need to groom very often, only when necessary. 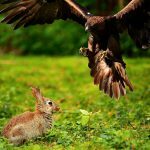 When your rabbit is not shedding, you should brush your rabbit every week. Light sheddings are not very noticeable. Big sheddings happen almost every 3 months. Big hairballs are swallowed with the food. And because rabbits do not vomit you need to give special attention in these moments. Some rabbits shed in a week others in a day. This is the moment your rabbit will need daily grooming. 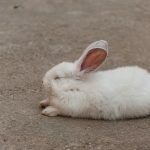 If your rabbit is very fast, and he sheds in a single day, you should pay attention and gather the fur before he does it. Give him special attention in that day. This is how you will avoid blocking the stomach exit. Do not panic if your rabbit gets bald in some areas. That it’s totally normal. For environmental flea control, do not use sprays or “bombs”. The best solution for fleas and mites is Revolution (selamectin) – kills various species, does not irritate. It’s the most efficient for rabbits. The perfect quantity is the one you would normally use for kittens. Use it exactly on the areas your rabbit cannot reach: the back of the neck, the top of the head. He will be fine in short time, especially if you clean thoroughly his cage. A great solution is also the flea comb, which will provide some immediate relief. Vacuum around the area to pick up the dead flea eggs. Use the flea comb with confidence. Your rabbit will love it. You can also use borax and diatomaceous earth. Leaving them on the carpet, they will kill any flea eggs. Here is a fact: rabbits are scared of bathing. For rabbits, it’s pretty hard to get dry. Blow dry your rabbit’s fur if he is not able to do that on his own. Avoid high temperatures. He can very easily enter the hyperthermic or hypothermic state. It’s better to avoid the water, especially if your rabbit is ill or he has fleas. You will add more stress to his already stressful feelings. Also, for cleaning, do not use talcum, because it’s toxic and it can cause cancer. Don’t cut the mats with scissors because their skin is very delicate. You could use mat splitter or mat rake. If their skin is scratchy with bald spots then your rabbit might have mites or an allergic reaction to fleas. Consult with your veterinarian. Avoid wire flooring in a rabbit cage. This may cause sore hocks to their feet. The house-rabbits need to have their toenails trimmed (same as cats or dogs). Do NOT declaw your rabbit because there’s an infection risk. If your rabbit is scratching too much then you should get a large box of hay or straw. For ear mite infection you can use Mitox or Ivermectin. You can remove ear wax with a cotton swab. Their teeth grow constantly and should be checked from time to time or they lose a teeth and won’t be able to eat they could starve to death. The nails should be checked every 6-7 weeks. The rabbit nails can grow long and can become very uncomfortable for your bunny. The nails should be clipped just before you see the blood inside the nail. We recommend this grooming glove from Bemix Pets. 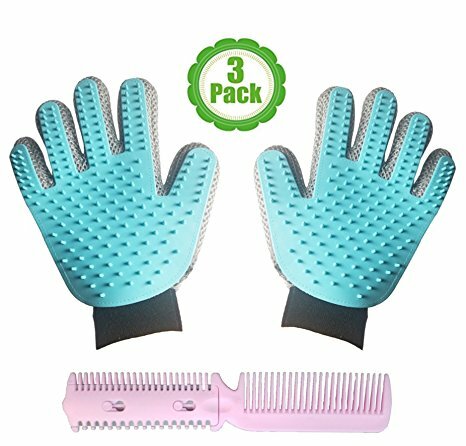 Grooming Glove 3-Pack – See our today’s offer!